A production in the context of the Royal Shakespeare Company’s “Roman Season”, Stratford-upon-Avon, 3 March to 9 September 217 in Stratford, in London, Barbican Theatre from 24 November 2017 to 20 January 2018, directed by Angus Jackson. The plot creeps up, subtly at first, suddenly disturbing, urging, electrifying, surging, subsiding and self-destructive like the conspiracy itself. Near impossible not to feel how closely the emotions and demagogy of classical times match our own world of experience, even if the 21st century’s rhetoric is hardly on the same quality level. On the backdrop of Robert Innes Hopkins’s puristic set, reflecting the Roman Republic’s brutal imperialistic arrogance, including the disturbing sculpture of a lion devouring a horse, the well-known drama unfolds in 2.5 gripping hours. 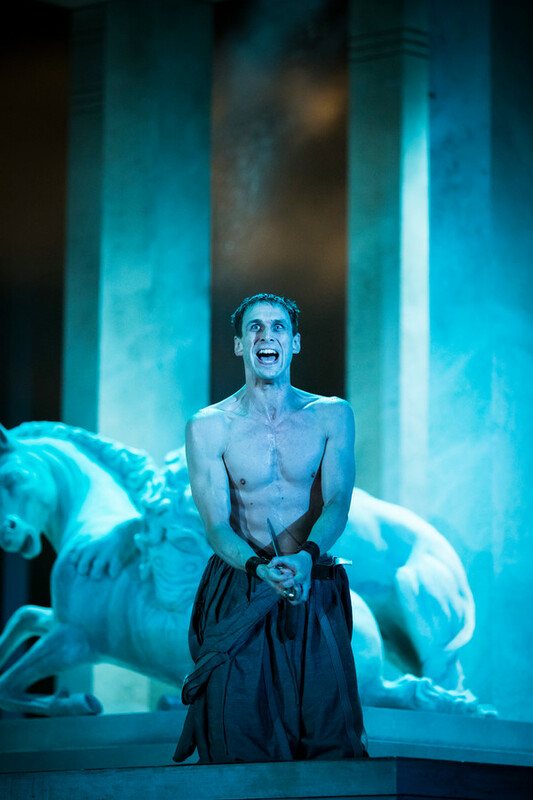 Brutus, in a highly sensitive interpretation by Alex Waldmann, is, in spite of his distinguished social status, an insecure person, torn between his friendship with Caesar and his sense of duty towards Rome. In his attempts to pacify his conscience, he paves the way towards his so literal end. Waldmann gives him traits of a reluctant hero who cannot forgive himself that there was no clean way out, and he depicts him with a tenderness, as if it were his best friend. 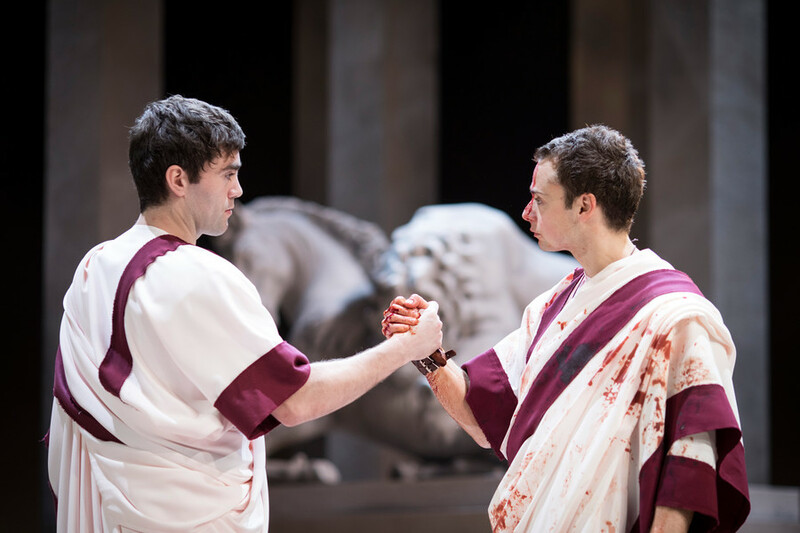 Cassius, the actual instigator of the conspiracy, is, impersonated by Martin Hutson, in wonderfully overstrung hands. A character, utterly unimpeded by scruples of any kind, jumping into action out of personal vexation and political conviction, this Cassius is a conveyor of uneasy feelings. Mark Antony, played by James Corrigan, is the seemingly noble picker-upper of shards, ultimately proven right by fate, at least in the context of these events. Corrigan operates his ice-cold calculation, his targeted manipulation with a gentle air of good-boy innocence. In the unequalled funeral speech, he plays people’s minds like an orchestra’s string section and thus unleashes the civil war. 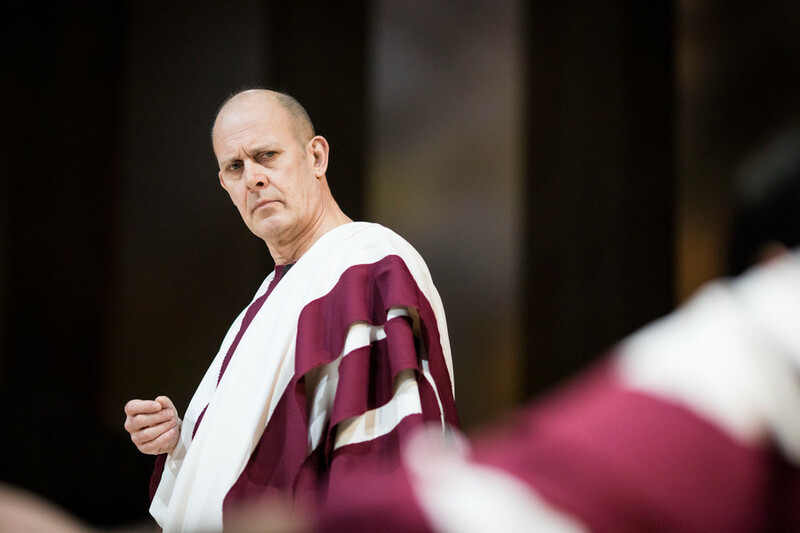 Julius Caesar, as portrayed by Andrew Woodall, is like a fish out of water in non-military life, used to giving orders, an egomaniac who tries to make up for his health deficiency and lack of diplomatic skills with vanity and obsession with power. Also impressive: Tom McCall as Casca, the cynic who sees Caesar’s interaction with ordinary people as nothing but theatrical gimmicks, which leaves him with sheer contempt for the populace’s darling. 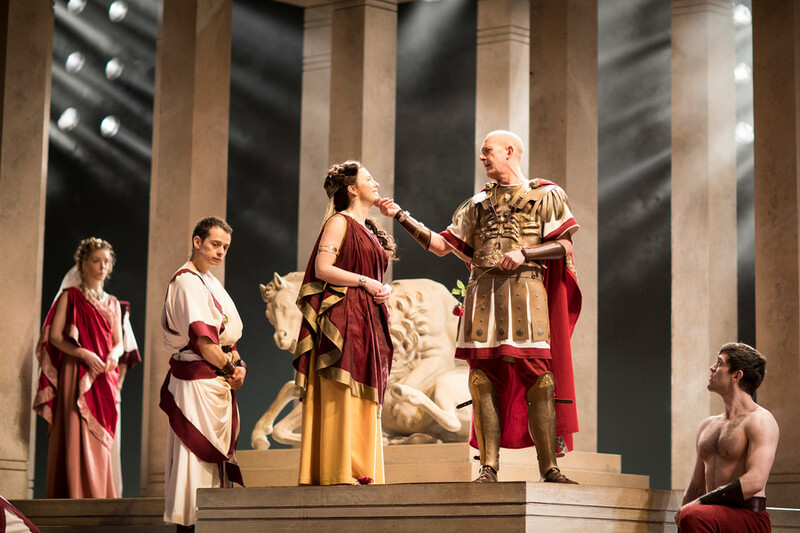 Portia, wife of Brutus, has little time to express her feelings in this male-dominated play, but Hannah Morris is absolutely amazing in filling this part with life. This entry was posted in Theatre and tagged Alex Waldmann, Andrew Woodall, Angus Jackson, Anthony Ofoegbu, Ben Allen, David Burnett, Dharmesh Patel, Hannah Morish, James Corrigan, Jon Tarcy, Joseph Adelakun, Kristin Atherton, Lucy Phelps, Luke MacGregor, Marcello Walton, Martin Hutson, Patrick Drury, Paul Dodds, Royal Shakespeare Company, Royal Shakespeare Theatre, Stratford-upon-Avon, Tom Lorcan, Tom McCall, Waleed Elgadi on May 21, 2017 by lingonews.